Here we are. Another year of NAMM. Another roundup of the best guitar pedals of this year’s show. After covering The NAMM Show for several years, I’ve noticed that it takes more to impress me than it once did. I’m not a brand loyalist, and I don’t really get excited about a pedal just because it’s a new release from a fan favorite builder. I maintain a healthy skepticism towards the builders that have innovated in the past, looking for any indication that they’re resting on their past successes or running out of ideas. Ultimately, I seek out pedals and gear that may inspire new perspectives on creating music with guitar, the “best guitar effects” that will produce the sounds in music yet to be heard. There were several pedals at the show that are pushing boundaries (and not just musically as I’ll discuss more near the end of this article). While there were many more pedals at this year’s NAMM Show than listed here, this article will focus on the very best pedals, narrowed down even further than previous Best Pedals of Winter NAMM lists to place greater emphasis on the innovative guitar pedals that are most deserving of your attention. As always these initial impressions do not constitute a final review verdict in any way. The busy NAMM Show floor isn’t an ideal listening environment, and many of these products are still in development and may change and evolve before their actual release. 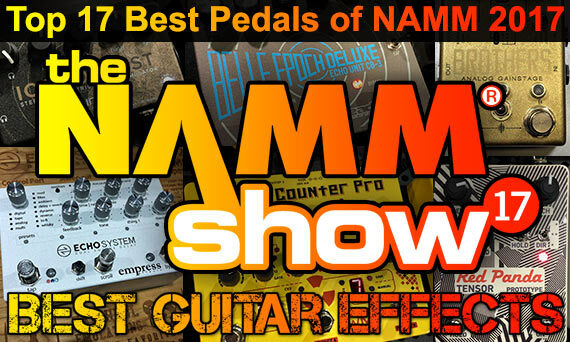 But overall I feel positive about this assessment, and it should give you a great starting point for researching the best guitar pedals from Winter NAMM 2017 for any new additions to your pedalboard. 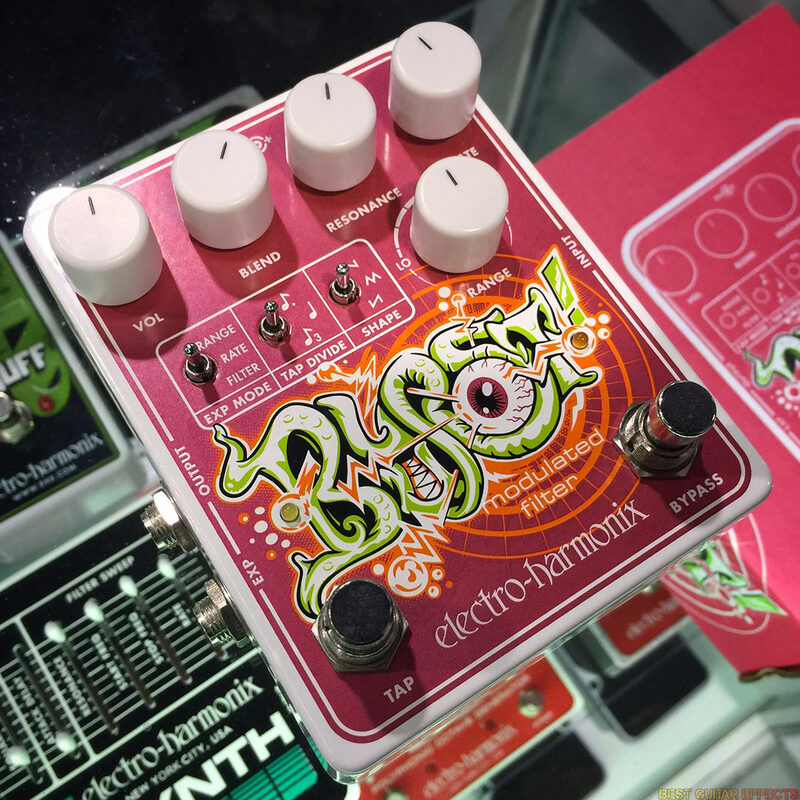 Now here are the Top 17 Best Guitar Effects Pedals of Winter NAMM 2017! I’d been waiting on this announcement for quite a while: a successor to the Empress Effects Vintage Modified Superdelay. But what Empress Effects unveiled at Winter NAMM 2017 is something on a whole different level warranting a new name for a new generation of delay tones. This isn’t a novel update to the Superdelay. It’s the Echosystem Dual Engine Delay, and it’s shaping up to be a game changer. What sets the Echosystem apart from the multi-algorithm delay pedal pack? Well, let’s start with the fact that it’ll give you 25+ delays modes out of the box. You can use these modes individually or use 2 delays at once in dual parallel, dual serial, or left/right. The possibilities for stacking delays are staggering. Let’s get back to the Superdelay (and VMSD) to contrast and elaborate on the known improvements made. While I was a huge advocate for the merits of the Vintage Modified Superdelay, it was mono only. The Echosystem has stereo I/O. The VMSD wasn’t MIDI enabled. The Echosystem will support extensive MIDI implementation. And if you’re a fan of the classic Superdelay sounds, you can expect to see plenty of them here. The user generated multi tap possibilities will return as will my personal favorite algorithm, the reverse octave up (it wasn’t in the NAMM units, but Empress Effects assured me it’s on the way). Expect to see some of the builder’s renowned tape delay sounds making a return. 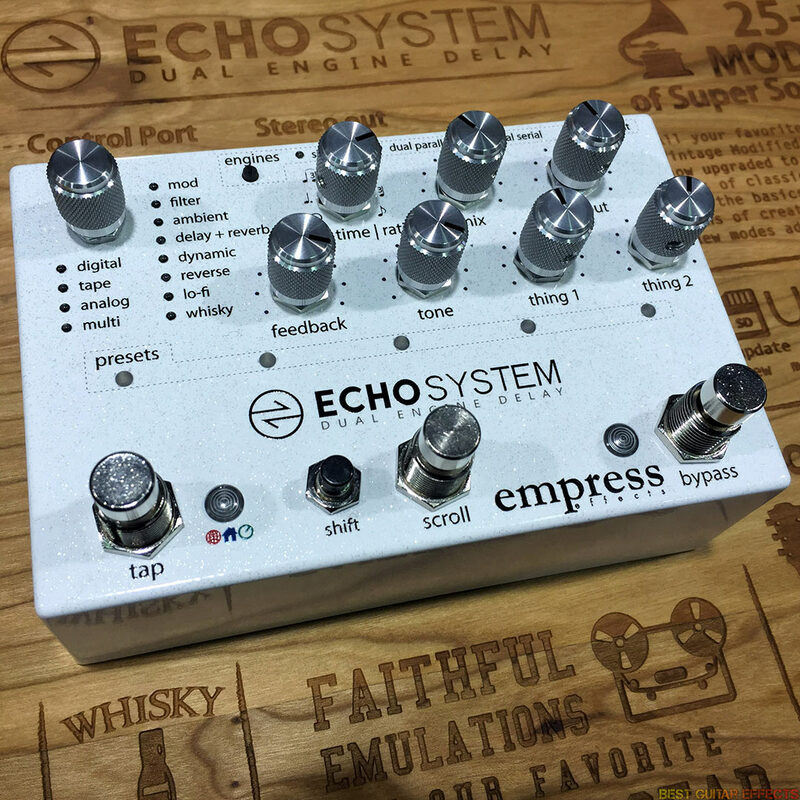 The Echosystem sports a similar design to the company’s hit Empress Reverb. You can expect to find the pedal’s 25+ delay modes indicated by the RGB LEDs next to the 12 mode types. All the expected classic delay types are covered: Digital, Analog, Tape, Reverse, and many more. There will be Delay + Reverb types as well. Whisky (similar to the Reverb’s “Beer” mode) is where the more outlandish and bizarre delays will reside (like the must hear “stutter” delay). Kudos to Empress Effects for a dedicated Lo-Fi section as the sounds at NAMM are already promising. And yes, there will be a dedicated Looper function to come. Expect to see more forum voting for new modes as well. Not even scratching the surface here, but let me make a closing statement. As excited as I was about the Empress Reverb, my expectations for the Echosystem are above and beyond, and this may be the new digital delay to beat when it drops this Spring. So what happens when you take an analog distortion engine and feed it into a computer to be filtered, bit-crushed, and mangled by 700 or so wave tables? I’ll tell you what happens. Faces melt. Heads explode. Old worlds are destroyed, and new ones are formed form the ashes. 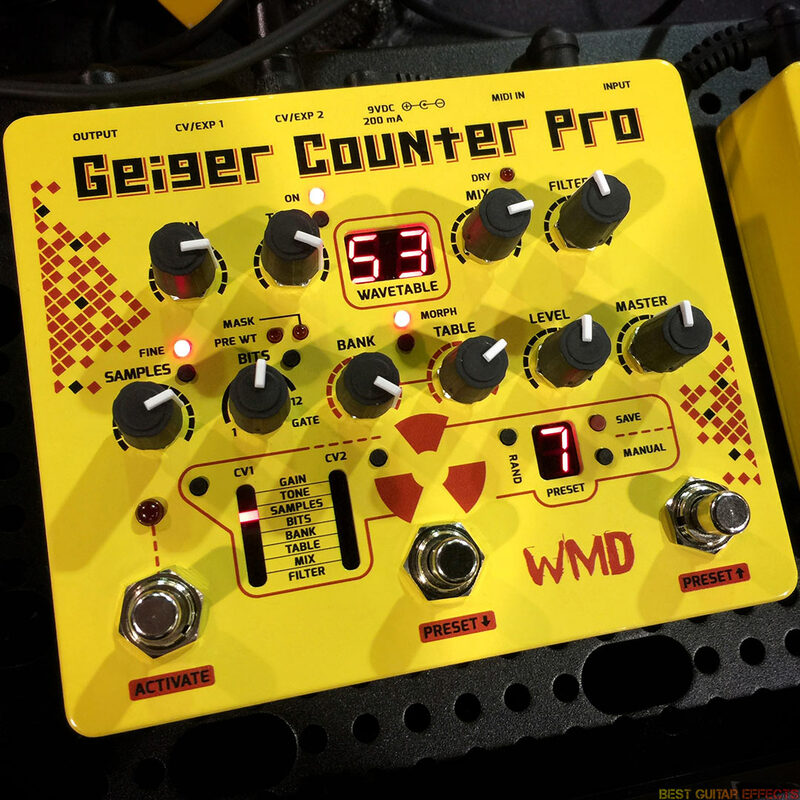 The WMD Geiger Counter Pro is the sound of armageddon and sonic revolution happening simultaneously. Been waiting on this pedal… for… ev… er. But fear not as the delivery of its payload is imminent. The Geiger Counter Pro is your post-rock, post-apocalyptic survival tool-kit. So many options here. You’ll be tweaking this one for a long time to come. Dedicated “Samples” & “Bits” knobs induce bit-crushing. Crank the Bits clockwise for a Gate, sure to come in handy when dropping megatons of gain on your audience. The Bank & Table knobs dial in the wave tables for mathematic destruction – or deconstruction – of your audio signal. This will decimate your sound beautifully, resulting in harmonically complex textures. There’s also a dedicated Filter for some some classic synth-style low-pass filtering. This’ll tame the extremities and maybe get you jonesing for the epic WMD Protostar. There’s also a dedicated knob for the optional Tone circuit and a Mix control. You can save and recall a host of presets from the pedal itself. With deep MIDI implementation you can take even deeper control on the pedal. Got a modular synth rig? There are 2 assignable CV ports (that are also expression pedal compatible) for crazy external control possibilities. WMD is about to drop a bomb on the pedal world. Brave guitar players will dare to detonate the Geiger Counter Pro; those who can’t handle it: take cover. On a side note, as my expectations for this pedal are very high, it’s important that I mention the one area of pre-release constructive criticism I have. The Samples knob has a huge range of great ring-mod style tones to be dialed in. The Fine button near the knob jumps the range to a smaller area in the upper register. Since it sounds so great using the Samples knob to tune the pitch to a note that’s in key with what you’re playing, it might be interesting if the Fine button allowed “fine tuning” in the range where the knob is currently set instead of jumping to a different register with a limited tuning range. Just a curiosity of mine that might allow more flexibility. 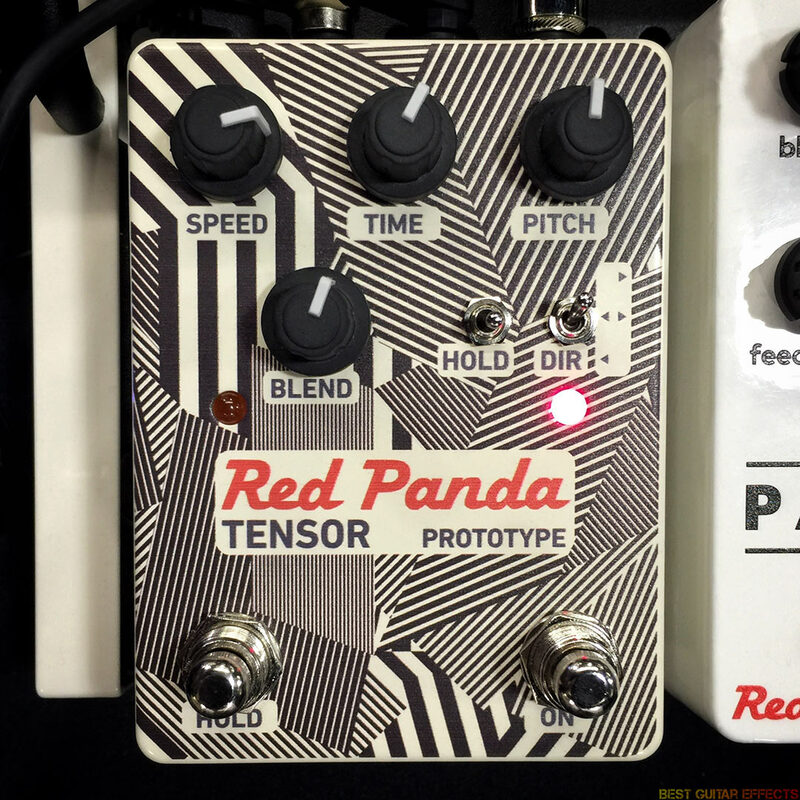 The Tensor is the most exciting Red Panda pedal since the Particle. Yeah, I just said that. When I heard that this pedal could do “tape stop” effects, I was excited and had to check it out. When I discovered that it could “stretch” your playing, I was more deeply intrigued. When I heard the smooth expression pedal controlled pitch-shifting in selectable intervals spanning -2 to +2 octaves, I was blown away. When I sampled and played audio via the Hold function and had it loop, play in reverse, and bounce back in forth, well, I was already communing with the clockwork elves, so I can’t really explain how beyond stoked I was. But when I returned from this all too brief journey and heard about something else that might make it into the production version, I imagined musical possibilities that could make the Tensor one of the most creative and inspiring pedals released for years to come. As it stands, the Tensor will be amazing. But if you’re really intrigued, cross your fingers with me in hoping it becomes a perpetual bridge to the fractal universe. So you’re familiar with the Nemesis Delay, right? It’s one of the best delay pedals to come along in recent years. Well, Source Audio are about to release the similarly awe inspiring Ventris Reverb. This is another example of a pedal that looks very promising and may further exceed expectations before its release. The biggest wow factor of this compact treasure trove of reverb is that it boasts an extra processor from the Nemesis Delay. This gives you true reverb spillover when changing from one preset to the next, a dream come true for guitarists who use multiple reverb sounds within a single song. While the Ventris looks like it may allow users to run two reverbs in parallel (and in stereo), I’m hoping Source Audio can crack the code to allow stacking reverbs in series (and in stereo, of course). 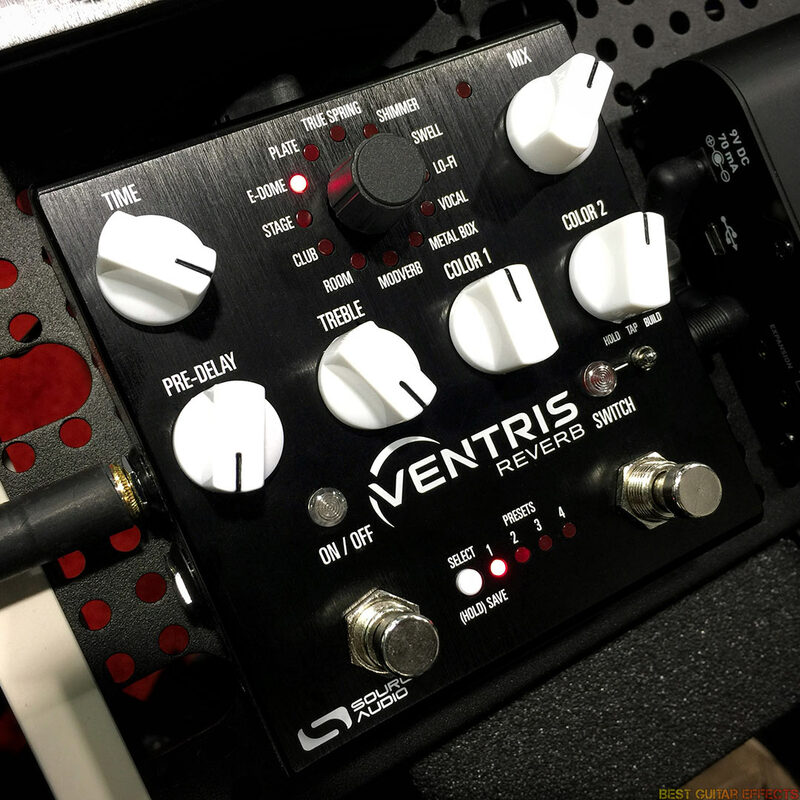 Like the Nemesis, the Ventris has presets, MIDI implementation, Neuro App connectivity, and a host of onboard parameter knobs that negate the need for menus. In addition to the Neuro App, a desktop compatible app is on the way for arguably more convenient preset editing. Expect the reverbs onboard (and the ones to come via the Neuro App) to be stellar. It won’t be a question of whether or not this pedal is any good. I’m expecting greatness. But if I find a worthy excuse to forgo stacking the Eventide H9 & Strymon BigSky for series reverb, the Ventris may greatly exceed my loftiest expectations. For those of you waiting for Chase Bliss Audio to stop innovating, don’t hold your breath. 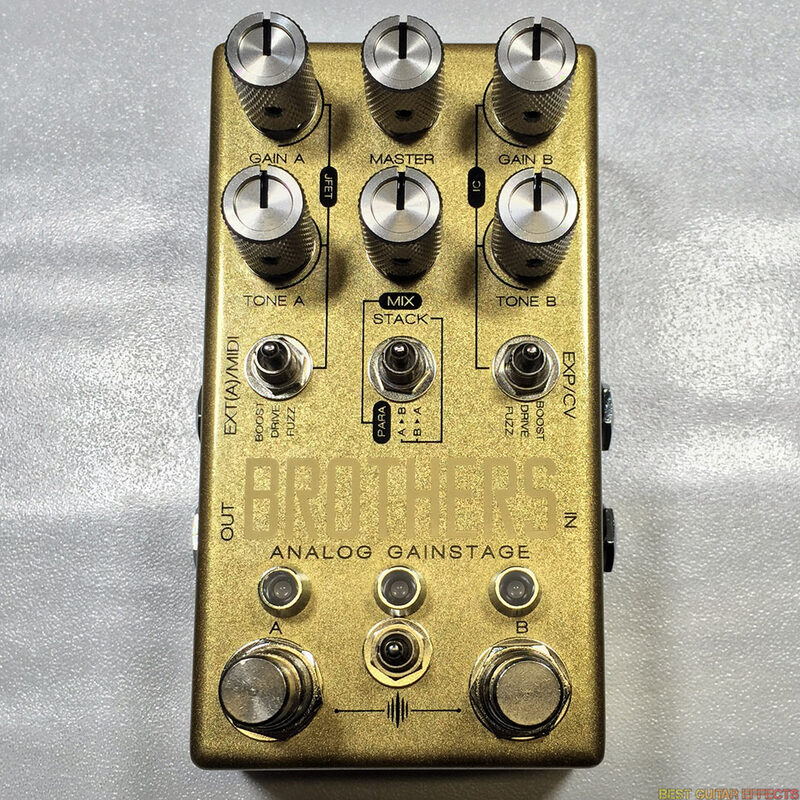 Brothers is a veritable playground of analog dirt/boost circuits that can be run separately, in series, and/or in parallel. The pedal has 2 sides, a JFET side & an IC side, each providing Boost, Drive, & Fuzz modes that were conceived by different minds. Mr. Joel Korte of CBA tackled the IC side (B), giving us a nice vanilla boost, a Tube Screamer inspired overdrive, and a ’77 IC Muff style fuzz. The JFET side (A) was designed by Wes Kuhnley and Peter Bregman of Resonant Electronic Design. Essentially, side A provides interpretations of the company’s Graviton Boost, Manifold Drive, and Acceleron Fuzz. That’s a whole lotta dirt in a single pedal that could potentially wipe a whole slew of pedals off your pedalboard. Will all the routing possibilities considered, that’s like 33 different dirt options from a single pedal. As Chase Bliss Audio did with the Tonal Recall at Winter NAMM 2016 before its Spring release, Brothers was shown at this year’s NAMM to get more feedback. I’m personally enjoying the sounds of the circuits when combined in series or parallel. (Disclaimer: I’m also helping CBA beta test it before release.) The trajectory is looking solid for yet another hit as Brothers is certainly unlike any dirt pedal to become before it and will likely be much greater than the sum of its parts. Neunaber is known for making some of the best reverb pedals you’ll hear, the Immerse being their most recent and notable offering. 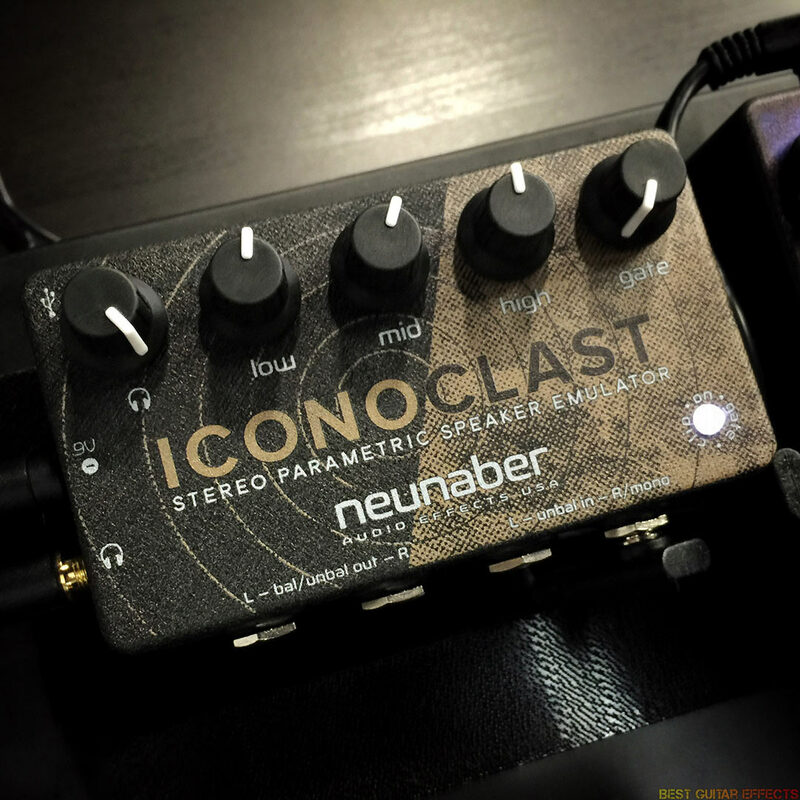 The Iconoclast looks to further extend Neunaber’s hold on the end of your signal chain by boasting what is arguably the most advanced speaker emulation technology in a dedicated compact pedal to date. With overdrive, pre-amp, and amp-in-a-box pedals achieving increasingly spectacular sounds in recent years, sounds that are more than sufficient for recording with or running live in an amp-less direct to mixing board guitar rig, an advanced speaker simulation pedal of this quality is long overdue. You’ll notice that there’s no foot-switch as the Iconoclast is an “always on” sort of effect. The pedal’s 3 middle knobs labeled Low, Mid, & High provide dead simple contouring of the frequency response of your virtual stereo speaker cabinet. The Gate knob lets you cut noise from your signal chain. A Headphone knob sets the volume for the dedicated headphone output, useful for late-night bedroom jamming or running an extra stereo signal to some other destination. That’s only the tip of this immense iceberg. Connect the Iconoclast to your computer via USB, fire up the Iconoclast Software, and take complete control over the tonal sculpting that this innovative pedal offers. I experienced this at NAMM and got a taste of the dynamic interaction between audio signal and the Iconoclast thanks to its real-time on-screen feedback. While our ears have grown accustomed to flawed and irregular frequency responses from actual speakers, it was intriguing to see a grotesque, jagged speaker impulse response juxtaposed with the smoother and tonally balanced EQ curves from the Iconoclast. You can use the editor to sculpt a smoother, more balanced version of your favorite IR. You can also tweak the many Gate and Output parameters for ideal response and integration with your guitar setup. It’s not surprising that Mr. Brian Neunaber has taken such a hi-fi approach and displays great expertise in this area considering his background developing professional speakers for QSC Audio. The sounds produced by the Iconoclast are beautiful and yet another compelling reason for leaving the amp at home when gigging. 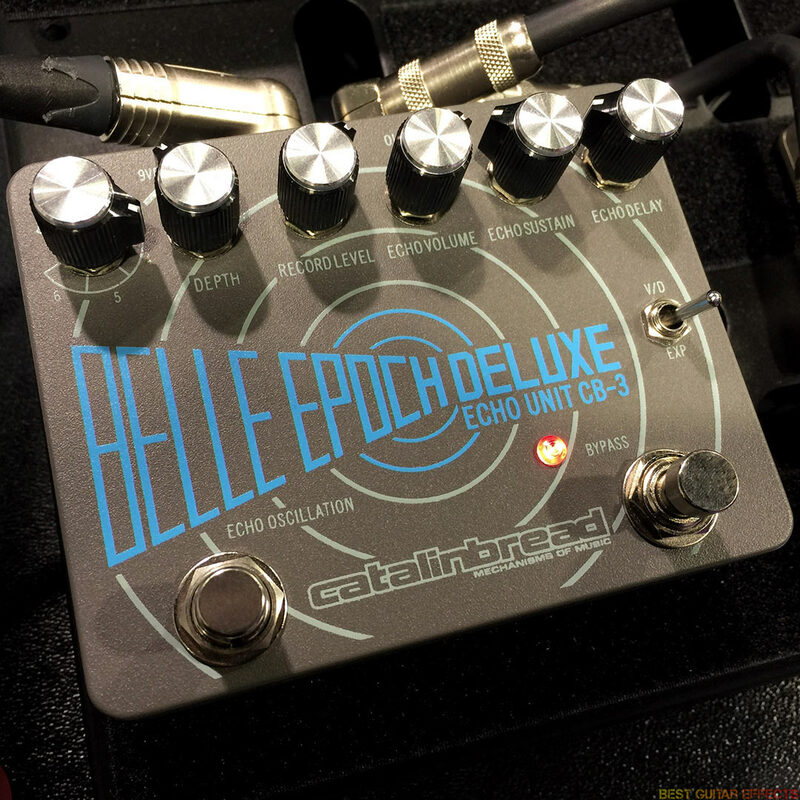 The Belle Epoch pedal was Catalinbread’s compact digital emulation of the legendary Echoplex EP-3. That pedal is dead now. Catalinbread just killed it. Long live the Belle Epoch Deluxe Echo Unit CB-3. Okay, the story isn’t that simple. And many folks will undoubtedly still love and appreciate the original Belle Epoch just as countless music fans still love the classic recordings that contain sounds made with an Echoplex. The Echoplex is famous for two reasons: beautiful delay echos & equally beautiful tonal coloration when used as a preamp. Catalinbread has attempted to distill the essence of both in two distinct products. Mr. Howard Gee spent months studying the circuitry of the iconic EP-3, painstakingly attempting to reproduce a component accurate recreation of the famed unit heard of countless iconic recordings. In the Belle Epoch Deluxe, you’ll get a static EP-3 preamp sound along with a glorious emulation of the kinds of delay echos heard from a vintage Echoplex along with some DMM style modulation thrown in. Howard had only to follow his muse and trust in the many loved records and tones that have become part of his DNA. I don’t think he was led astray as the sounds at NAMM were killer. Catalinbread went the extra mile and made a little something extra during pursuit of the EP-3 holy grail. The Epoch Pre is meant to be the ultimate pedal solution for any guitarist who wants the distilled sonic elixir of EP-3 preamp tone on their pedalboard. Just as guitarists would set an Echoplex on their amp to run directly into it when pre-amping, the Epoch Pre is meant to add that final tonal touch to your guitar signal before it hits your amp. The Epoch Pre uses the same large components and up-converted voltage as the Belle Epoch Deluxe, hence its seemingly larger size for a “boost” pedal. And while this pedal boasts the same Echoplex flavor as the Deluxe, the Epoch Pre takes the EP-3 preamp concept a bit further. The Early/Later button lets you get early EP-3 sounds with that characteristic mid-range bump or later sounds with a broader frequency response. The Bias lets you go from the classic EP-3 sound to a hotter, wider sound. The Boost foot-switch gives you a second preset amount of boost. The optional Buffer lets you drive long cables back to your amp. The Balance controls volume from minimum to noon settings and creates subtle frequency and phase shifts at higher settings. You even get two outputs. 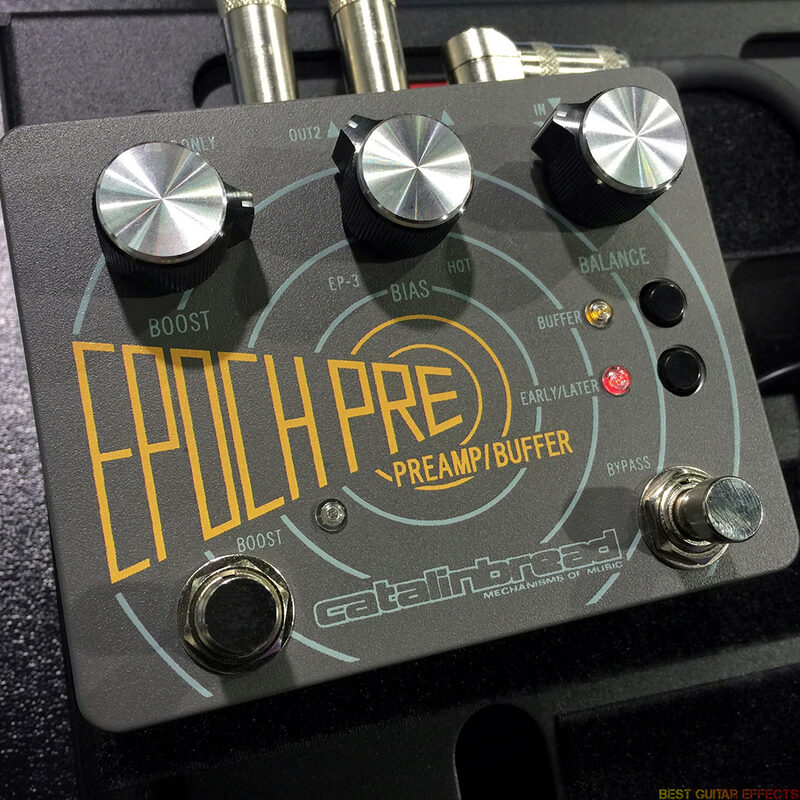 Catalinbread may have just released the ultimate EP-3 inspired booster pedal. Atomic & Studio Devil previously teamed up to release the Atomic AmpliFire, a powerful DSP based amp & speaker simulator that put plenty of quality sounding emulations on your pedalboard. While the AmpliFire is an excellent solution for leaving your amp at home in favor of a unit that’ll fit on your pedalboard, it was still a bit larger than some guitarists would prefer. 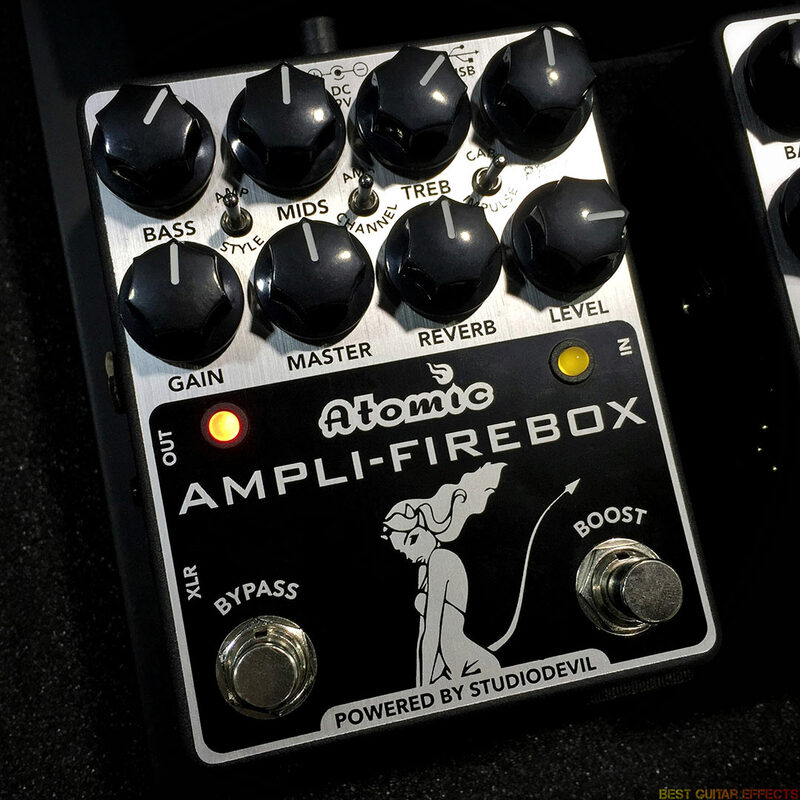 If size was your most notable gripe with the AmpliFire, the Ampli-Firebox may be the solution for you. Essentially, this pedal trims all the fat, cutting out the onboard effects (except for an amp-style Reverb) while maintaining a full set of of amp-style controls. Guitar pedal junkies are increasingly ditching multi-channel amplifiers in favor of a single great clean amp foundation and using pedals for overdrive and distortion tones. If that’s all you need, the Ampli-Firebox can give you that clean amp with speaker cabinet sound and run the signal to the FOH (front of house) mixing board via the ¼” output or XLR output. If you need a Boost, there’s also a dedicated foot-switch and Level for that as well. The AmpliFire provided several amp options, many of which are very, very good. The Ampli-Firebox can accommodate up to 9 amp models accessible via onboard flip-switches. A Cab switch also lets you select from 3 different speaker cabinet impulse responses. (Amp and speaker sounds can be selected/changed via USB connectivity.) While this pedal will let you play through a gig-worthy single amp option (with boost), I wish Atomic included a MIDI input for allowing easier selection of the 9 amp models from a switcher when gigging. I’m sold on the idea of having one excellent amp sound at my feet, but I’d rather not do “the bend” and mess with knobs/switches when playing a gig. This will be an excellent product. A 1.5 hardware update with a MIDI in will be even better. Been waiting on the Novaplex Delay for a while. And now Fox Pedal have another interesting looking pedal to watch for: the Quiver Harmonic Tremolo. Essentially, these are two digitally controlled effects pedals with some deeper functionality. The Novaplex is a digital delay; the Quiver is an analog harmonic tremolo. 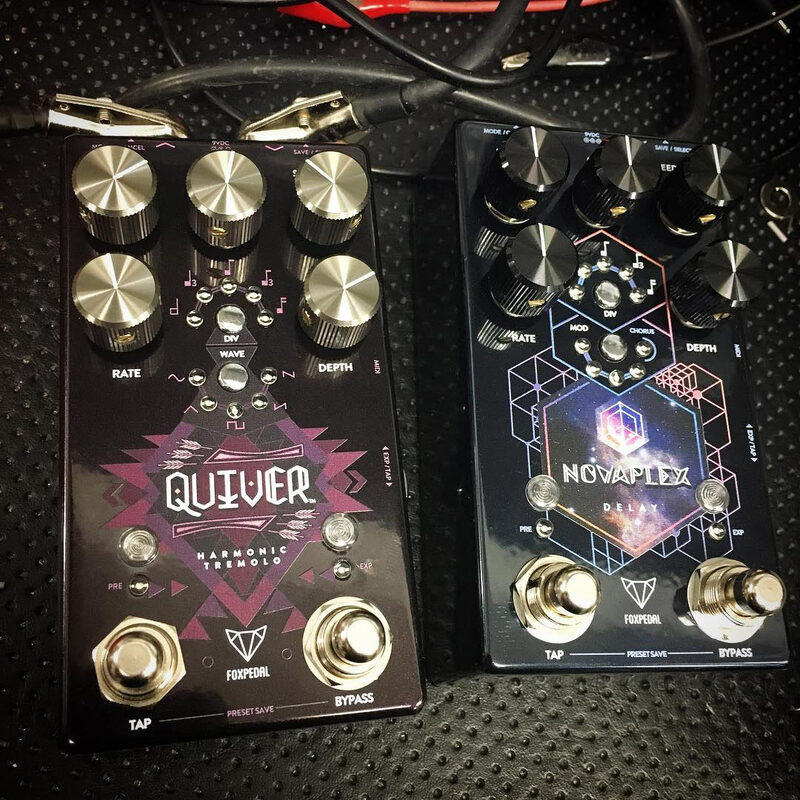 Both pedals feature tap tempo, plenty of parameter controls, tap divisions, and Modulation on the Novaplex and Waveform options on the Quiver, respectively. I love guitar compressor pedals. It became an area of study for me to discover the nuanced differences that various types of compressors can have on the sound of a guitar and understand how compression changes my approach to playing guitar. 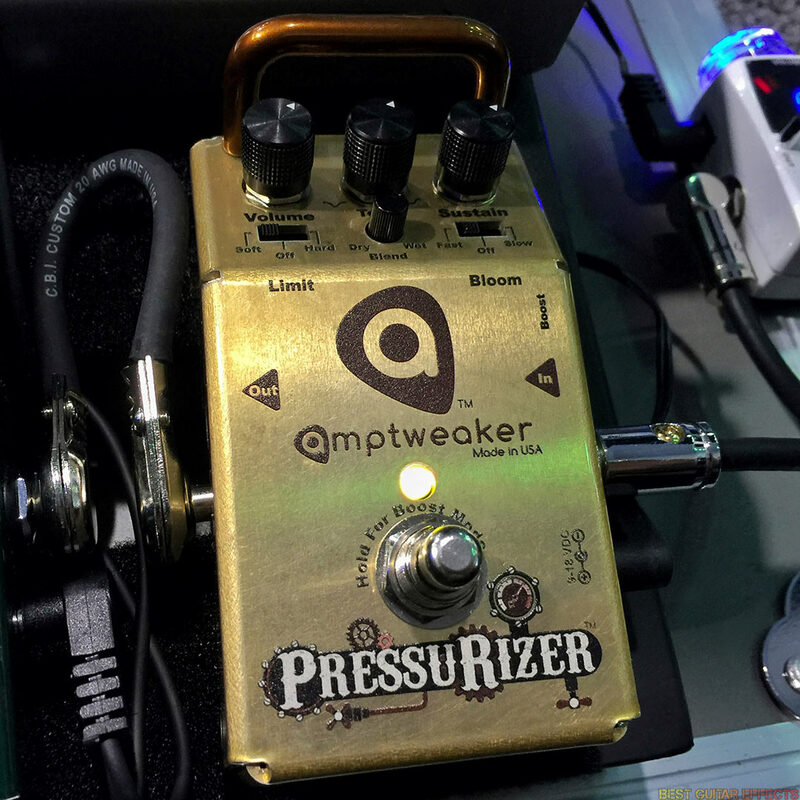 While there are relatively few compressor pedals that push the creative boundaries of how compression is applied, the Amptweaker PressuRizer is definitely one such pedal that offers a few noteworthy deviations from the norm. The PressuRizer boasts a compression chip from THAT Corp, the company known for the kind of high grade VCA compression whose lineage can be traced back to the legendary dbx 160 compressor units. The key parameter controls are the Sustain & Volume knobs, similar to the basic approach of an old OTA style comp like the MXR Dyna Comp or Ross Compressor. Then there’s a Wet/Dry Blend knob that blends in your compressed signal with your dry signal for New York style parallel compression. The Tone knob has a greater range of usability than most with the unique ability to apply a subtle mid scoop to the compressed signal for a less cluttered, more transparent mid-range. There are a few other surprises that offer even more performance flexibility. The Limit section lets you activate an optional Soft or Hard limiter-like effect that further tames dynamics. The Bloom section lets the wet signal increase from silence at a Fast or Slow speed; with a blended wet/dry signal, this helps retain a natural pick attack with increased sustain. For guitarists who like to leave their compressor “always on”, you’ll appreciate that you can hold the foot-switch to activate an “always on” mode that lets the foot-switch be used for an optional clean boost when needed. The pedal even has a smart relay bypass that recalls previous bypass status, a very convenient consideration for guitarists who use effects switchers. This pedal will surely be gold. 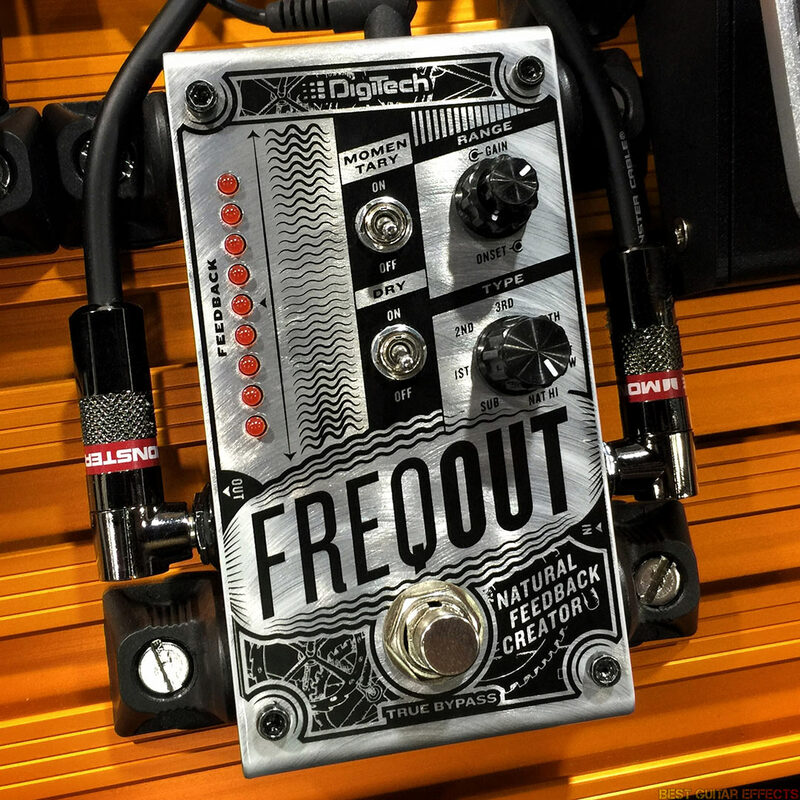 The DigiTech FreqOut sounded awesome at NAMM. If you’ve ever tried inducing singing harmonic feedback onstage, you’ll know of the few challenges involved. First, it helps to have deafening volumes, far louder than what may be allowed in a smaller club venue or that would be preferred for ideal cabinet miking. Heaps of gain helps. And if you can soundcheck early, you’d also want to make tape lines on stage of where to stand to induce the exact feedback notes you want to hear. Forget all of that. The FreqOut can induce controlled feedback at any volume or gain level in any of its 7 available harmonic pitch intervals. Essentially, the FreqOut looks at your signal and hones in on those preferred harmonics to create its singing feedback pitches. It’s ideal to use in momentary mode where you step on the foot-switch at those precise moments to add a majestic beauty to sustaining notes. If you kill the dry signal you can induce ebow-like sounds as well. Gain & Onset knobs control how much feedback is blended in and how long it takes for the feedback to increase to full intensity, respectively. The FreqOut isn’t the first feedback inducing pedal to hit the market, but DigiTech has certainly created what will likely be the best feedback pedal released to date. The Rainger FX Deep Space Pulsar reminds me of years past, driving to band practice while listening to Daft Punk’s Discovery. That record and Homework were the precursors to my growing interest in electronic dance music over the years and sparked my interest in applying studio effects and sound design techniques to live guitar. Sidechain compression is one such effect that has long been a staple of dance records, and this pedal does one thing: pumping, throbbing volume attenuation similar to the effect of using side-chain compression. The pedal includes a kick drum mic for integrating this pedal into a live setting with an acoustic drummer. Just plug the mic into the pedal and place it into the sound hole of the kick drum to let the drummer’s kick hits induce the pedal’s pumping effect. A Pad switch lets you increase the sensitivity to pick up softer kick hits. If you don’t have a kick signal to feed into the Deep Space Pulsar, you can use the included Igor foot-pad to tap in a tempo. It’ll even allow corrective taps to keep the pulsing on the beat if you’re manually syncing along to a rhythm source. What I’m most excited about is the possibility feeding the pedal a kick drum from a DAW (like Ableton Live) or a drum machine. Lately I’ve been using an Empress Effects Compressor in my signal chain to get that side-chain compression effect by feeding a kick drum from my laptop through the audio interface to the pedal. My one wish is for the Dip to have a dynamic sensitivity option so that you could feed it a quieter or louder kick drum for gentle or hard driving pumping. 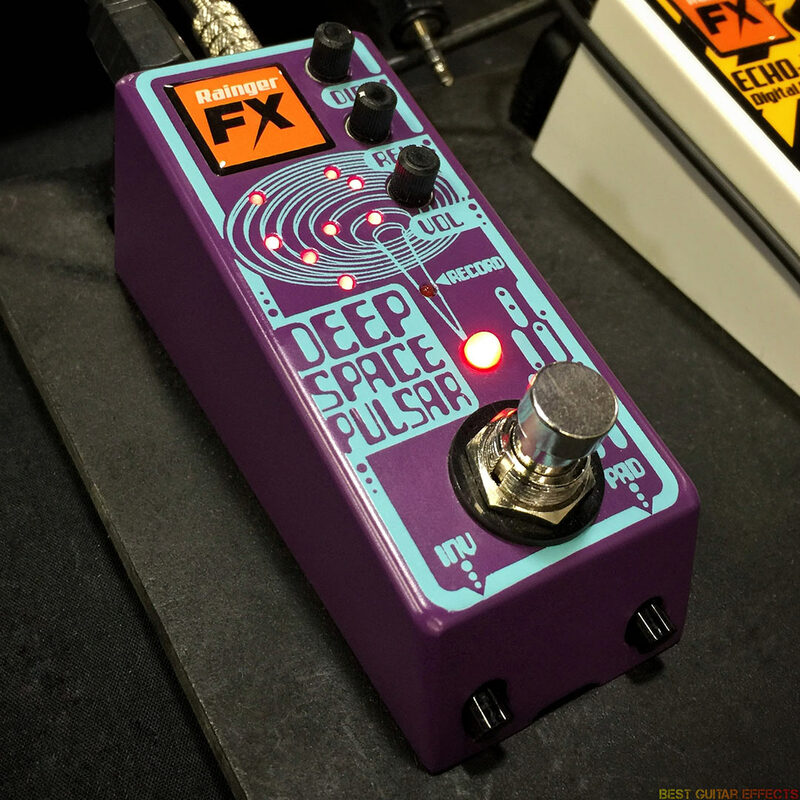 The Deep Space Pulsar is the first pedal since Rainger FX’s own Minor Concussion sidechainer that focuses solely on this effect. You can also invert the ramping effect for a trem-like sound that some musicians may find use for. The Deep Space Pulsar is a compelling little pedal to consider if you’re a sidechain compression enthusiast. 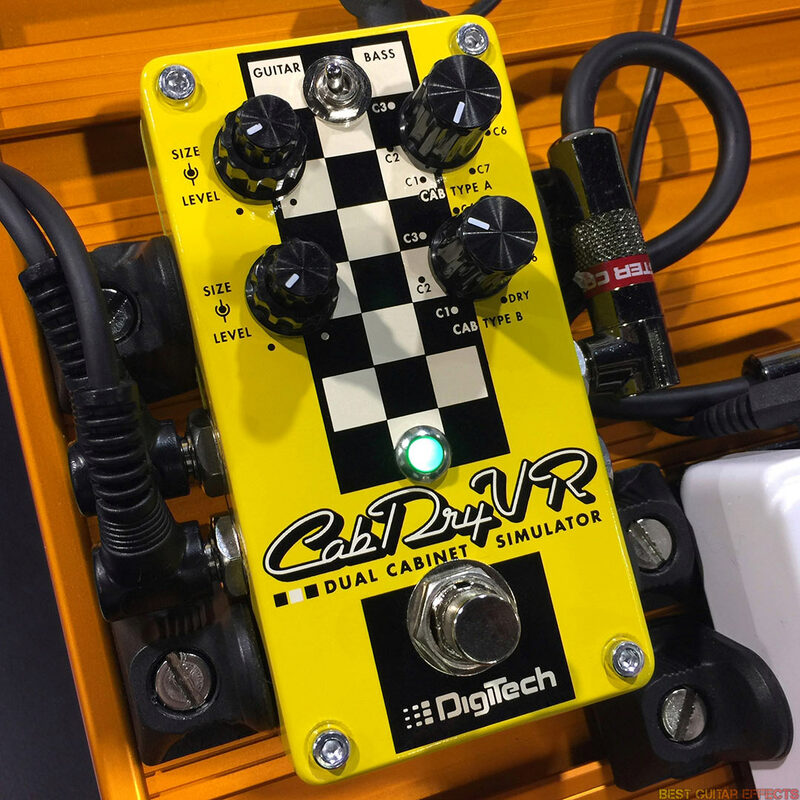 The DigiTech CabDryVR is a dual cabinet simulator that has some noteworthy features to make it worth considering for an end-of-signal-chain replacement to using a real speaker cab. It features a selection of 14 guitar and bass cab impulse responses, 7 for guitar & 7 for bass. Cab A & B are output via 2 separate outputs. This allows you to match cabinets on both outputs or use 2 different cabs for your stereo setup; pair with 2 different preamp or amp-in-a-box pedals for a sound similar to miking 2 separate amps for a stereo spread. I’d also imagine that a band with 2 guitarists could run into each signal path for 2 distinct sounds from the same pedal. Or maybe feed a bass and keyboard into the bass cabinets, also. On Cab B the Small Combo 1×8” speaker is replaced with a Dry option for a direct through sound if running one side into an amp and the other to a different destination with cab emulation. Both Cabs also have individual Level & Size knobs for adjusting volume and perceived size of the cabs. It sounded pretty nice in DigiTech’s amp-less demo rig at NAMM. I’m expecting it to live up in actual use as well. On the wild west coast where Winter NAMM 2017 took place, this mysteriously shrouded pedal beckoned me to plug in and make some bizarre sounds. Unfortunately, the harsh NAMM conditions (i.e. noise levels from nearby booths) can make it difficult to really hear the nuances of the gear you’re trying to listen to. 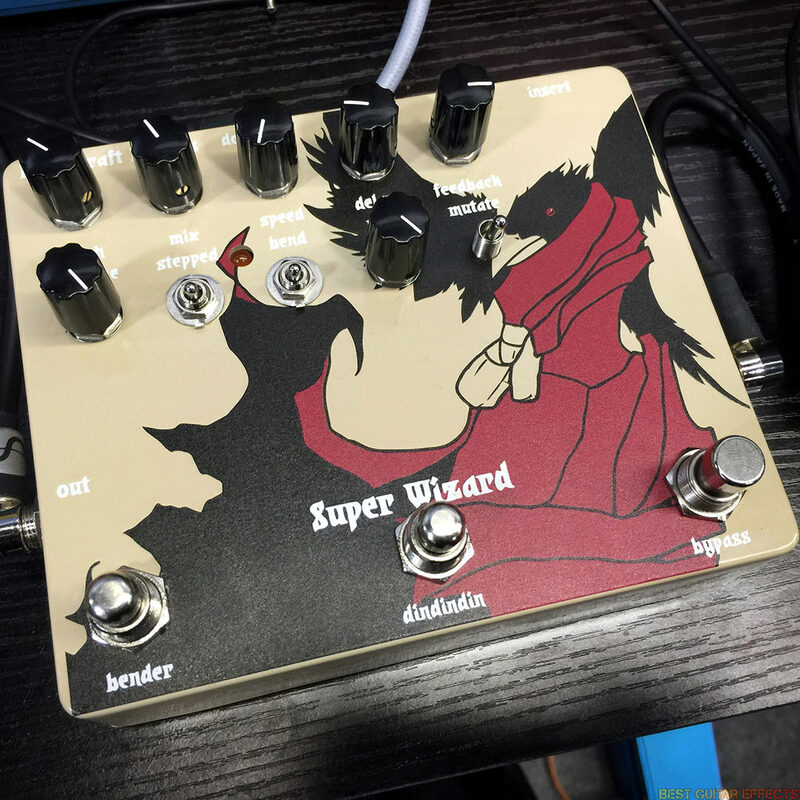 But from what my ears struggled to hear on the chaotic NAMM show floor, the Dwarfcraft Super Wizard made enough of an impression to be included here. The Super Wizard comes from a pedigree of the builder’s previous releases that should give you an idea of what to expect that’s probably better than what I can explain. Dwarfcraft previously took their insane Pitchgrinder and transformed it into the calamitous Wizard of Pitch, a pitch mangling sonic assault weapon. They stuffed the Wizard of Pitch into the Super Wizard and combined it with their Minivan Echo, a lo-fi digital delay with oscillation and mangled delay sounds. The result is a chaotic instrument that warps your guitar into ambient, soundscapey new textures. A couple momentary foot-switches give you real-time performance control over the insanity that ensues when you activate the pedal. I’m a big fan of synth style filtering, particularly low-pass filters. The Electro Harmonix Blurst Modulated Filter brings you an analog low-pass filter with adjustable resonance. Instead of being envelope controlled (like an auto-wah or auto-filter), the Blurst is LFO controlled for automated rhythmic filtering. Tap tempo and 3 Tap Divide options provide flexibility for live syncing. The 3 Shape options let you choose from triangle, rising saw-tooth, or fall saw-tooth waveforms. Perhaps the most exciting aspects of the pedal are the expression pedal modes. These give you the option of controlling either the Range, Rate, or Filter. Controlling the Filter via exp pedal disengages the Rate & Range knobs for a manual sweeping through the entire frequency range. This sounded killer at NAMM. While the Blurst definitely supports CV input for control over the selected exp pedal parameter, I’m hoping to get confirmation that CV control also allows control over the full filter sweep. If so, this pedal will be a force to be reckoned with if hybrid modular/CV rigs are your thing. So those are the 17 best all-new guitar pedals shown at Winter NAMM 2017. Rabbit Hole FX is a pedal builder from Durham, North Carolina. You may have heard in 2016 that NC passed something called HB2, the “bathroom bill” that sparked a statewide civil liberties uproar primarily because many viewed it as a “deeply discriminatory” attack against LGBTQ citizens. This led to boycotts of the state by businesses and performers which resulted in millions of dollars in lost revenue. Pro-equality voters made their voices heard in the gubernatorial election this past November, ousting seated governor Pat McCrory, a vocal supporter of the bill. Organizations like EqualityNC are still working diligently to repeal HB2 and promote equality in the state of North Carolina. Rabbit Hole FX is currently donating 100% of profits from sales of the A ‘Merkin Fuzz to EqualityNC. Not “a portion of” or some small percentage – ALL profits. This is a big deal for several reasons. First, overturning and preventing discriminatory legislation seems like a pretty good idea. I’m sure patriotic Americans and anyone who respects civil liberties will agree. But the gesture represents something else worth talking about. Rabbit Hole FX is a small boutique pedal builder. 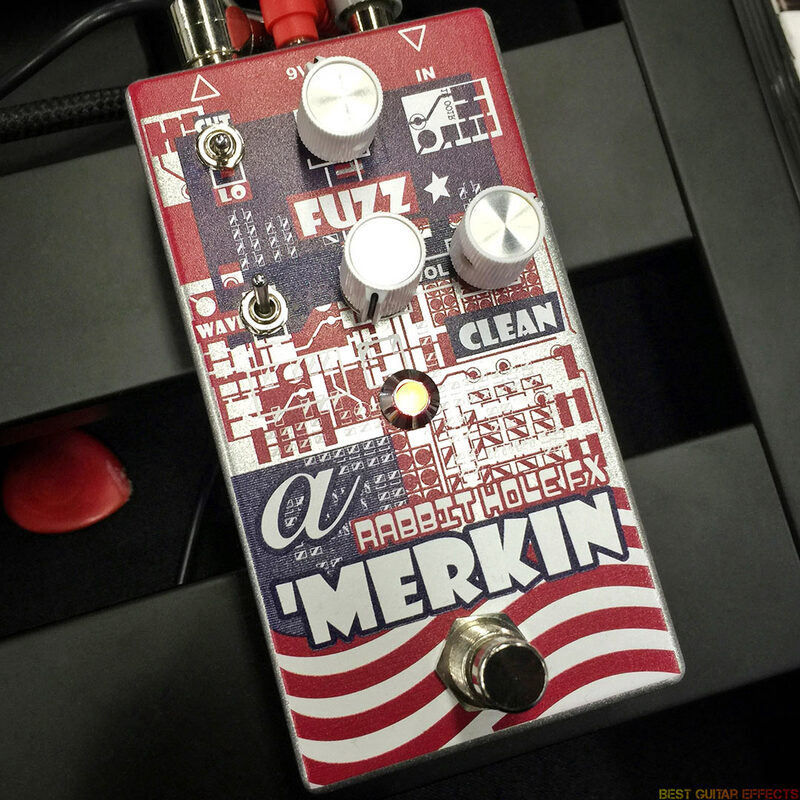 The A ‘Merkin Fuzz is only their second pedal offering. Newer businesses generally place a big focus on profits and expansion, but Rabbit Hole FX saw an opportunity to make a difference in their local community and took action. With only 2 products currently available*, one of their two income streams is being donated to this cause in its entirety. Big companies sometimes donate small percentages of profits to charitable institutions. For companies with large capital reserves, such contributions may be quite sizable. While a greater monetary sum donated to a worthy cause can have a larger impact and significantly contribute to positive change, I’d argue that a smaller contributor who’s given a greater percentage of their available resources is more committed to making a difference and is likewise more deserving of any bestowed recognition. Imagine the impact it would have if more companies contributed a greater portion of their resources to making a tangible difference in the world. Today there is no shortage of issues that need attention. One person can only do so much. A single small business can only do so much. Many people working towards common goals can do a lot more. Big props to Rabbit Hole FX. I hope their dedication to the fight against injustice inspires other companies to take a stand for issues they believe in. *The Chaosmic Fuzz is the builder’s first release. The A ‘Merkin Fuzz is the second. The upcoming Rabbit Hole FX Phaser was shown at Winter NAMM 2017 and will be the builder’s third release. Best wishes to everyone in 2017. May your musical journey be one of progress. 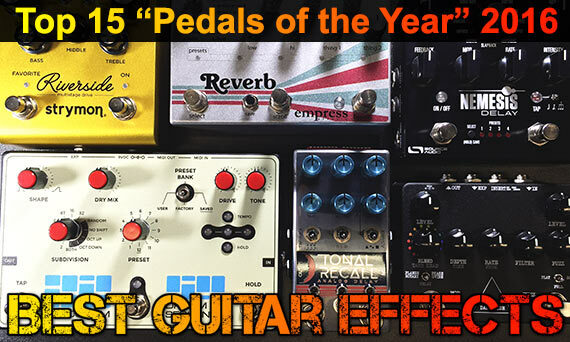 Now check out the Top 15 Best “Pedals of the Year” 2016! I assume the Freqout does a completely different job to its similarly names Moogerfooger compatriot? When it generates feedback, can it do the full Pete Townshend/Jimi Hendrix freak out? If so, I want one! Wow setting an even higher bar for BGE! It’s like a candy store!